I used to be a single Mom dealing with day-to-day life and finding humor in different situations. Now I've remarried and my world is very different. I am obsessed with six degrees of separation! Six degrees of separation is the theory that everyone and everything is six or fewer steps away, by way of introduction, from any other person in the world, so that a chain of “a friend of a friend” statements can be made to connect any two people in a maximum of six steps. It was originally set out by Frigyes Karinthy in 1929 and popularized by a 1990 play written by John Guare. Nowhere is Six Degrees of Separation more evident than on The Book of Face. 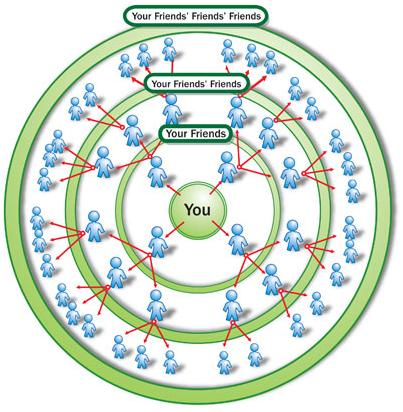 All you do is look at mutual friends but even further is to peruse a friends list of friends page. Scroll and when you come across anything that says 2/3/4… mutual friends just hover over it. AHA! This is where you find some interesting connections. You might find that a new friend is friends with someone that knows a childhood friend of yours. That is three degrees right there! How cool is that? I could spend hours on The Book of Face checking out these connections. I know it makes me sound like a stalker but if you put it out there then I can look. Facebook just organizes it for me. What do I do with that information? Absolutely nothing! I have a new friend and I thought she might know and old friend and she tells me when she makes a new friend she goes through the friend list looking for connections or anything interesting. So see… I’m not the only one. I bet you do it too. I love making new connections [friends]. It can lead to more interesting experiences. Stuff to check out in D.C.